Welcome to the 15th edition of Trending Through the decades. This is a fun link up where you can show how your age decade styles a current trend. This week it's all about stripes. Stripes were all over the place in the fall and seem to be holding their own for the spring trends too. I chose to wear my striped tee with a knee length leather skirt (yep that's me at almost 54 wearing a leather skirt!) 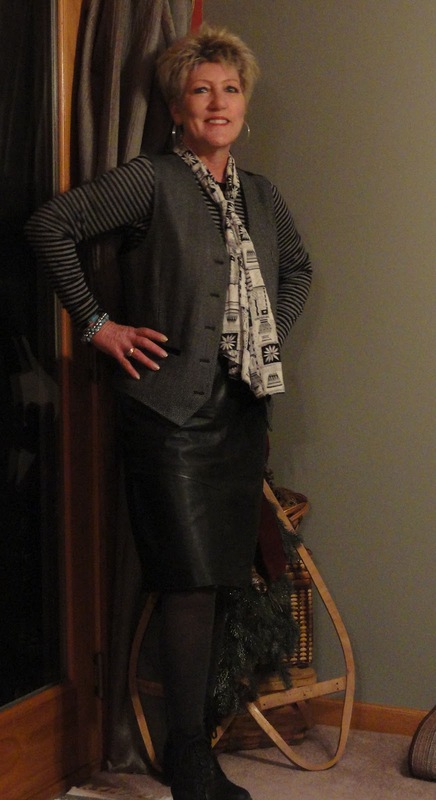 mensware vest and dark grey tights (I think the closest to bright tights I will wear) . The way I tied the scarf is what I learned new this week. I think when things settle down I might do a weekly post on what I learned this week from blogging. I actually tied it like a mans tie and I love the style. I also posted Sunday about getting my outfits together the night before........So this is my first attempt. Sadly, the only thing I didn't like was the scarf. I really should have gone with something brighter. I kind of feel like I was dressing for a dark and cloudy day. Shortly, I will be picking out my outfit for tomorrow. My husband says sometimes I'm like dress up Barbie. What the hell! A girl's gotta do what a girl's gotta do. Bottom, line I paid almost as much for my whole outfit that I paid for my tights!!!! Come on summer, these things are to expensive! You look totally amazing in that skirt and the stripes looks great with it too. The skirt is a definite keeper. How do you get such amazing bargains, Tammy?!! The skirt does look great on you and I like the way you've tied your scarf (I've not tried that one)! love your outfit!!! I've been adding striped blouses to my wardrobe--i love the crisp clean lines of the stripes. as usual...thrifty pieces that look like a million bucks when put together by you! Stripes ! Yay... I think I read your mind....or you read mine. Thanks for hosting! Dress up Barbie- something my man would say too! I love picking out clothes the night before- makes the morning run so much more smoothly! You look incredible-the scarf and the leather skirt put the icing on the cake! Yay I took photos of stripes last week and will post soon to link-up! Oooh, I'm totally into stripes! I'll wear something and link up soon! And how selfish am I, I pressed published before I'd even reffered to you! You are soooo rockin that skirt! Fab!!!!!!!!! Lovely stuff! My outfit queued up for tomorrow includes a striped shirt, and I will link up then, for sure! Love the outfit! I love the dress up Barbie comment! Too funny! You are rockin' the leather skirt! What a find at $2.50? That's insane. Very edgy look, LOVE it! How long will we be able to link? I have to think fast...and I teach until 10 on Wednesdays. Hope I can still join in on Thursday. You're looking great and you've given me an idea for an orphan scarf of mine. And, I've come back and linked up. Lovely project, and I'm so pleased to be participating!